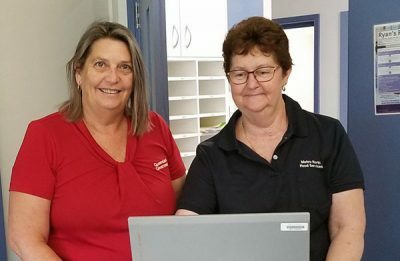 Caboolture Hospital Dietetic Assistant Sharmaine McBain and Kilcoy Hospital Cook Kathy Ellem collecting lunch orders using the computer workstation on wheels. The hospital already offers freshly cooked meals, baked scones and flexibility in choice that larger facilities often can’t provide. The new system adds the ability to offer patients the options which are specific to their healthcare needs. Acting Executive Director Dr Simon Bugden said that a patient’s diet affects their ability to heal well and fast. “Our new electronic system ensures patients are only offered menu choices that comply with their dietary requirements,” Dr Bugden said. “It can be tricky to know which foods contain food allergens and which are suitable for different texture modified diets and this takes the guess work away for our cooks and operational staff. “Food service staff collect menu orders each morning for lunch, dinner and breakfast the next day using a computer workstation on wheels. “The software interfaces directly with other patient information systems to ensure that patient menu information is up-to-date in real time, rather than relying on manual cross-checking and updating paper menus. Kilcoy Hospital kitchen staff prepare about 30,000 meals for patients, staff, visitors and the community each year. The new system has additional clinical benefits including the ability to track menu orders, calculate nutritional intakes and supplement compliance. It also means the dietetic team at Caboolture Hospital can more easily support the Kilcoy kitchen with menus and any tricky special diet requests.